For models with several Higgs doublets we present an alternative method to the one proposed by Branco, Gerard and Grimus, in 1984, to check whether or not CP is spontaneously violated in the Higgs potential. The previous method is powerful and rigorous. It requires the identification of a matrix U corresponding to a symmetry of the Lagrangian and verifying a simple relation involving the vacuum expectation values. The nonexistence of such a matrix signals spontaneous CP violation. This approach may be far from trivial as complexity grows with the number of Higgs doublets. In such cases it may turn out to be easier to analyse the potential by going to the so-called Higgs basis. The transformation to the Higgs basis is straightforward once the vacuum expectation values are known. The method proposed in this work is also powerful and rigorous and can be particularly useful to analyse models with more than two Higgs doublets and with continuous symmetries. G.C. Branco, M.N. Rebelo and J.I. Silva-Marcos, CP-odd invariants in models with several Higgs doublets, Phys. Lett. B 614 (2005) 187 [hep-ph/0502118] [INSPIRE]. J.F. Gunion and H.E. Haber, Conditions for CP-violation in the general two-Higgs-doublet model, Phys. Rev. D 72 (2005) 095002 [hep-ph/0506227] [INSPIRE]. 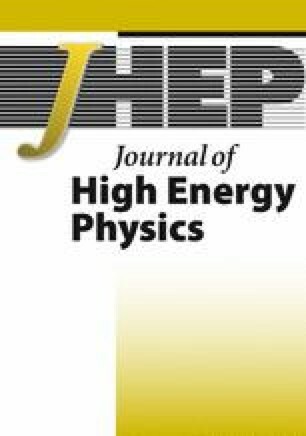 L. Lavoura and J.P. Silva, Fundamental CP-violating quantities in a SU(2) ⊗ U(1) model with many Higgs doublets, Phys. Rev. D 50 (1994) 4619 [hep-ph/9404276] [INSPIRE]. F.J. Botella and J.P. Silva, Jarlskog-like invariants for theories with scalars and fermions, Phys. Rev. D 51 (1995) 3870 [hep-ph/9411288] [INSPIRE]. D. Emmanuel-Costa, O.M. Ogreid, P. Osland and M.N. Rebelo, Spontaneous symmetry breaking in the S 3 -symmetric scalar sector, JHEP 02 (2016) 154 [Erratum JHEP 08 (2016) 169] [arXiv:1601.04654] [INSPIRE]. E. Derman and H.-S. Tsao, [SU2 × U1] × S n Flavor Dynamics and a Bound on the Number of Flavors, Phys. Rev. D 20 (1979) 1207 [INSPIRE]. J. Kubo, H. Okada and F. Sakamaki, Higgs potential in minimal S 3 invariant extension of the standard model, Phys. Rev. D 70 (2004) 036007 [hep-ph/0402089] [INSPIRE]. D. Das and U.K. Dey, Analysis of an extended scalar sector with S 3 symmetry, Phys. Rev. D 89 (2014) 095025 [Erratum ibid. D 91 (2015) 039905] [arXiv:1404.2491] [INSPIRE]. I.F. Ginzburg and M. Krawczyk, A simple criterium for CP conservation in the most general 2HDM, arXiv:1612.04612 [INSPIRE].